Used duct tape to hold the wires down as tight as possible. Clear packing tape across the front so the lights don't pop all the way through. Around an inch thick after all is done. The battery pack hung over his shoulder and was sufficient counterweight to keep it in place. 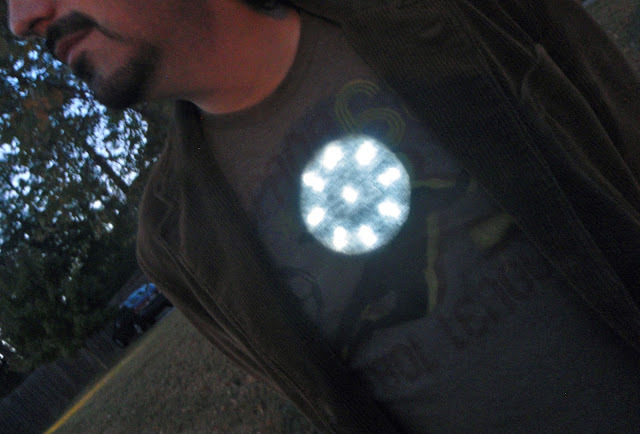 I thought about making a necklace for it but the cord from the arc reactor to the battery wasn't long enough to reach his pockets. He said over the shoulder worked great. It never felt like it was going to fall. Not being attached to the shirt allowed his clothing to move freely like it would for Tony Stark. And the batteries never failed after being on for five hours of party fun. It looked fabulous. He even won best costume at one of the two parties. Easy, cheap, clever and comfortable costume. I didn't like the Halloween store lab coats so I went to a real medical uniform store and bought a fitted ladies' lab coat for less than the costume store cheap ones. I hand stitched NCIS with embroidery floss. Then I created the ID card on my computer, laminated it and attached it with the clips sold at office supply stores. I made the Caf-Pow label on the computer and taped it to a super-sized QuikTrip cup. My man did a fabulous job this year drawing on the siderweb neck tattoo. More drawn on tattoos, spiked cuffs and choker, plaid skirt, skull tee, knee socks and my old steel toed Docs and the outfit's done. Only issue with going as a TV character is only people that watch the show know who you are. Fortunately most people figured me out. Then on Sunday morning we were up early to get the kids down to the zoo for a Trick or Treating dress rehearsal. 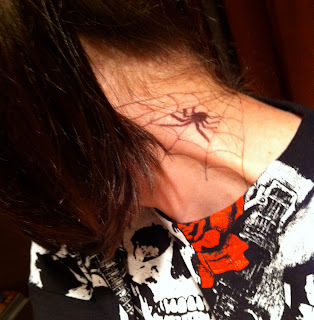 I picked up a bottle of Spirit Gum at the Halloween store on Saturday with the idea in mind to glue plastic spiders all over my body. And that's just what I did for Boo at the Zoo. It was so incredibly easy! 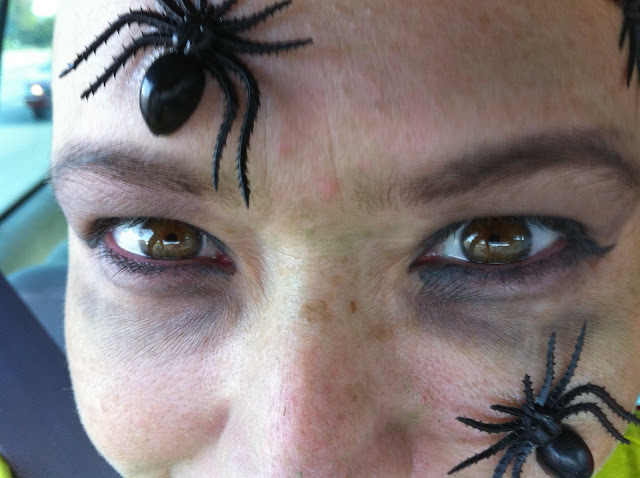 I had them on my face, arms and legs. Kids and adults alike all enjoyed the effect. Harry Potter, Snake Eyes and Darth Fairy ready to take on the animals! The zoo had a great child-size hay maze for the kids. 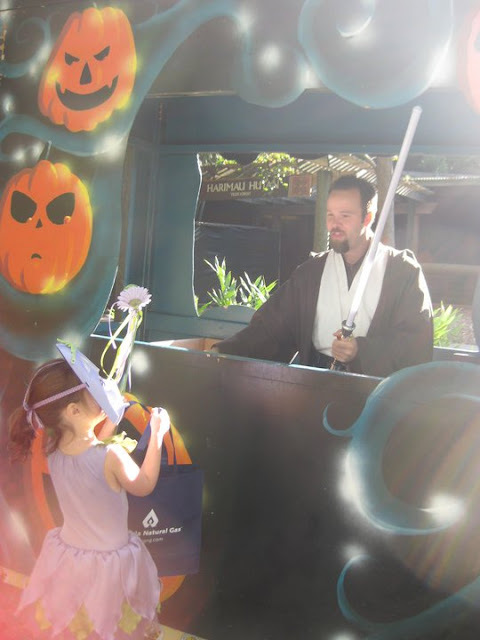 Darth Fairy used the Force to have a Jedi surrender the goodies! Now the countdown is on for me to finish Princess Fierce's Catwoman costume and my own Medusa in time for the neighborhood party on Saturday and real trick or treating on Sunday! Happy Halloween Week!